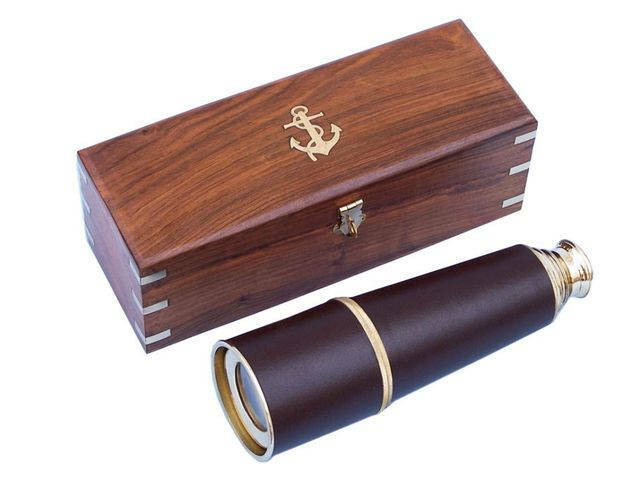 The Hampton Nautical Premium Quality 27" Brass and Leather Spy Glass Telescope is a great gift for a nautical navigator in your family. The spy glass measures 27" when its four brass tubes, which are clear coated to protect the brass from tarnishing, are fully extended. The spy glass is 9" when collapsed and features a leather stitched handle. This spy glass also comes with a solid brass cap to protect the lens. Simply push the eyepiece in or out to bring the image into clear focus. The 27" spy glass is shipped in a beautiful felt-lined brass-inlaid hardwood case. The box features brass side inlets on all sides and the Hampton Nautical solid brass anchor-with-rope logo on the top. The box is smooth hardwood, gloss finished, measuring 9.5" wide with a solid brass clasp in front. Beautifully crafted following classic designs, each of these brass telescopes makes a perfect gift for a captain and his ship. Head out on the open ocean with this marine telescope and use it to find your destination as you sail through the seas. 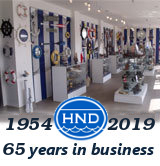 With a nautical telescope you truly will be the captain of your ship, capable of seeing far off vessels, dangers in the water, or land as you sail into a friendly port. As a trusted and essential tool to sailors for centuries, brass telescopes have earned their place in nautical lore, and are available now as a remarkable gift that is both historic and truly useful. Give one of these fabulous brass telescopes to a friend or family member who loves sailing, and ensure that they can always find their safely way home.